7 nights in room category chosen; FAP (breakfast, lunch, afternoon tea and dinner); all tax and service; airport taxi transfers both ways; welcome cocktail, drinks package in room fridge and culinary amenity on arrival; 12 beach or boat dives; substitution of a day dive to night dive to a maximum of 2; and escorted walk of the Old French Colonial Plantation. Also included are use of tennis court/equipment, water sports equipment (snorkeling, kayaking, paddle board, mini-sailing, wind-surfing), sunrise and sunset yoga, beach chairs and towels on the resort’s 2 beaches. If you make your CORAL KALEIDOSCOPE reservation at least three months in advance, you will be entitled to the 7th night free (Except Dec 20 - Jan 2). Simply deduct one night from the weekly package price to obtain the EARLY BOOKING package rate. The weekly package rate can be adjusted to shorter or longer stays by deducting or adding room nights (minimum stay is 3 nights). Please note that unused features are non-refundable and non-exchangeable or transferable. Marine Park fee of US $15 to be paid locally. Scuba equipment rental (except tank, weights, weight belt, mask, snorkel, fins) not included. Dive guide and boat trips included. First dive is a shore check-out dive. 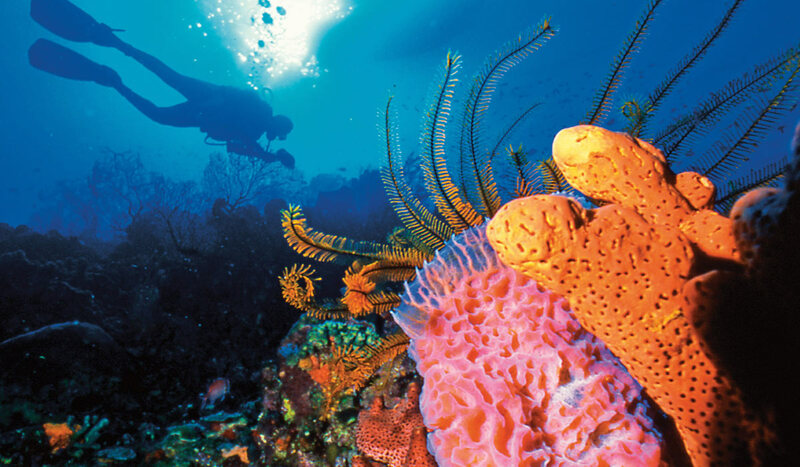 Certain medical conditions/medications may prevent you from scuba diving. Consult a diving physician prior to travel if applicable. For non-diver accompanying a diver deduct US $30 daily. Seasons: Winter: Dec 20/187 - Apr 15/2019 • Shoulder: Apr 16 - May 31 & Nov 1- Dec 19/2019 • Summer: Jun 1- Oct 31, 2019. Please note that unused features are non refundable, non exchangeable or transferable. Scuba Equipment Rental (except tank, weights, weight belt, mask, snorkel, fins) not included. Dive guide and boat trips included. First dive is a beach check-out dive. Marine Park Fee of US15 to be paid locally. Certain medical conditions/medication may prevent you from scuba diving. Consult a diving physician prior to travel if applicable. Rates subject to change.